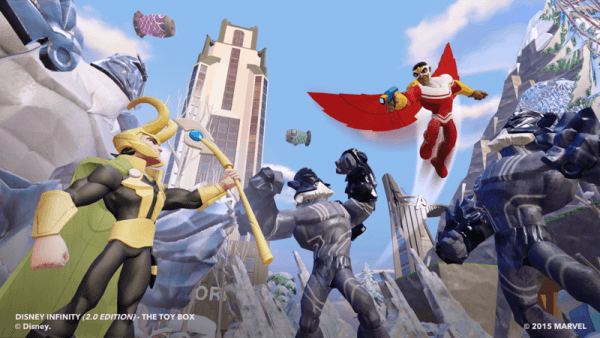 The Disney Infinity 2.0 Starter Set came with the Avengers Play Set and three of earth’s mightiest heroes, now the game has come full circle with the release of Loki and Falcon, the final two pieces to the Avengers puzzle. They say that sometimes the best is left to last and these two final characters definitely hold true – they each bring with them new abilities, new animations and some of the most uniquely detailed figures of the set. Falcon is a lesser-known superhero in from the Marvel Universe, introduced to many fans though either Captain America: The Winter Soldier or in the animated Avengers Assembled. 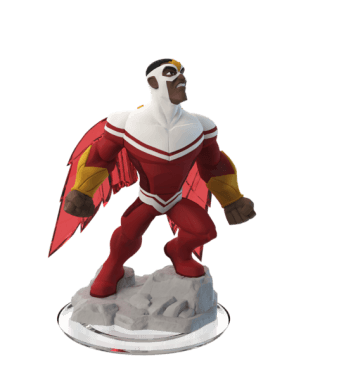 His appearance in Disney Infinity is inspired almost verbatim from the latter, with his red/white/gold outfit and wings of a… falcon (whodathunk it?). As you would expect from Falcon, his skills lie firmly in the air. 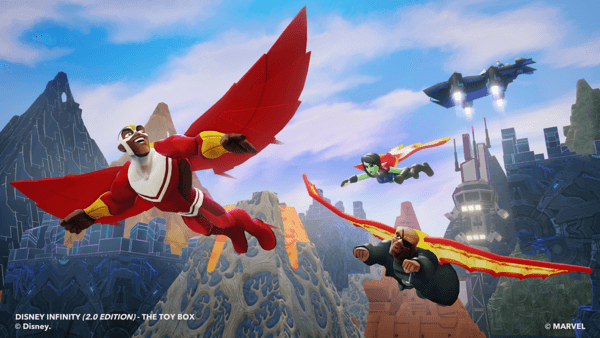 his “Into the Clouds” ability can be leveled up to Lv2, making him by far the fastest flier in the entire Disney Infinity line-up, even able to out-speed just about any flying vehicle. This is a double-edged sword as being able to zip about from place to place is incredibly advantagous, but flight controls can be a bit tricky at the best of times, and when you are going at supersonic (slight exaggeration) speeds, it becomes even more difficult. As for physical attacks, Wilson can hold his own. While no powerhouse like his bff Captain America, he can go toe to toe with other regular humans like Black Widow or Nick Fury. As with most characters, Falcon also has a ranged attack where he shoots off hard-light “Feathers” at his enemies. The feathers are relatively powerful on their own but once leveled up they cause little explosions and can be charged up and fired in rapid succession to become devastating. His special move makes use of these hard-light feathers too, shooting them around him in order to damage all nearby foes. Falcon has some unique character traits that help separate him from the rest of the DI crew, the first of which is the fact that when he is on the ground his wings aren’t present. They unfurl from his backpack once you leap into the air and begin flying. It isn’t the most impressive of programming to make happen, but it still looks absolutely awesome none the less, and that’s really the point of Disney Infinity isn’t it? When it comes to his figure, there is only so much that Wilson can do – he wears a tight red/white spandex outfit with a pair of wings, so it is difficult to make him stand out. However, Disney and Avalanche went above and beyond and made his wings out of translucent-red plastic to really have them stand out. Aside from the Infinity Crystal range of figures from the first game, no other character has a similar property on their figure. 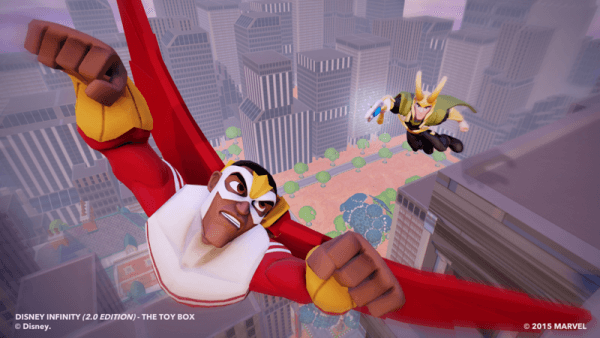 It seems fitting that Disney Infinity 2.0 would wrap up with two final additions to the Avengers Play Set, and both Falcon and Loki are incredible figures that add a lot to not only the Play Set, but the Toy Box too. Also, now that all of the figures are released, eager collectors are able to unlock a special Star Wars themed item from the Hall of Super Heroes (but I wont tell you what it is 😉 you’ll have to go find out on your own).